Hiking on snowshoes is a great way to explore the outdoor world in winter. You can take advantage of a special opportunity for outdoor exploration with a naturalist on Saturday afternoon, January 23, at the Audubon Nature Center. For a fun winter experience, it’s hard to beat snowshoeing. 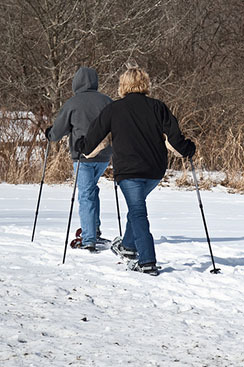 Whether you have snowshoed before or are looking to try a new winter activity, you are invited to join a snowshoe hike at the Audubon Nature Center on Saturday afternoon, January 23. Snowshoes are available for rent from Evergreen Outfitters or you can bring your own. Beginning at 1 p.m., you can snowshoe on the trails with a naturalist, looking for signs of animals, finding insects that are active in the winter, and seeing how plants handle the cold temperatures. If it grabs the group’s attention will be explored. General nature knowledge will be shared, along with enthusiasm and curiosity. The outing will cover about a mile and a half or two in a little over an hour, then hikers will return to the Nature Center building to warm up inside over some hot chocolate, coffee, and snacks. Drinks and snacks will be provided, and you are welcome to bring a treat to share. Participants may even try hand-feeding chickadees in the bird feeding area outside the building. The fee of $20 includes snowshoe rental; it is only $10 if you have your own snowshoes. Paid reservations are required by Friday, January 22; they can be made by calling Evergreen Outfitters at (716) 763-2266. The folks at Evergreen Outfitters, a locally owned and operated outdoor gear store, are passionate about the outdoors and appreciate the opportunity to share that passion by working with the Nature Center. They welcome visitors to their new location at 61 Water Street in Mayville, New York. To learn more, call the Nature Center at (716) 569-2345 during business hours or see “Intro to Volunteering at the Nature Center” at www.jamestownaudubon.org. The Audubon Nature Center is at 1600 Riverside Road, one-quarter mile east of Route 62 between Jamestown, New York, and Warren, Pennsylvania. Winter hours for the building and Blue Heron Gift Shop are Monday-Friday 10 a.m.-1 p.m., Saturdays 10 a.m.-4:30 p.m., and Sundays 1-4:30 p.m. Bald eagle viewing and trails to walk, snowshoe or cross country ski are open dawn to dusk daily.